Nut butter as I discovered is a fun and easy thing to make. I decided to make walnut butter for the recipe I would use in this challenge. The only ingredient used in my butter was walnuts. I used about 1 cup of walnuts, put them in my bullet processor and whirred it until I had a butter, simple.Now the fun part, using the butter. 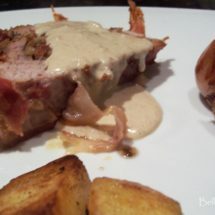 I decided to use it in a sauce to accompany a stuffed pork fillet wrapped in prosciutto. This was a make up as I went recipe and I was really pleased with how it turned out. The whole idea for the recipe came from a jar of pickled walnuts I had in the cupboard that I had picked up from David Jones’ Food Hall recently and I was itching to use. Unfortunately they never made it in to the recipe as when I opened them there was webbing, a dead moth plus bits under the of the lid, I ended up using some raw walnuts instead. Medium/thin sliced prosciutto – enough to wrap the pork to your liking. This is where I should draw a diagram. Cut your pork fillet, in order to stuff it. I tend to make a sort of a “<” shape when I cut it, it then lays out quite nicely as a flat even piece ready to have stuffing spread out over it. Lay out enough prosciutto slices side by side to equal the length of the pork fillet. Lay your pork fillet on top of the prosciutto slices. Mix all the stuffing ingredients together and spread it over the pork fillet. Then roll your pork fillet up with the prosciutto. Rub with some olive oil and then cook in a medium heat oven until cooked through. I had run out of kitchen string so I didn’t actually tie my fillet as you can see from the pictures. In a non stick pan gently fry the walnut butter and then add the cream, keep stirring until well combined and then add a good splash of verjuice. Add salt and pepper to taste and simmer until it thickens slightly. 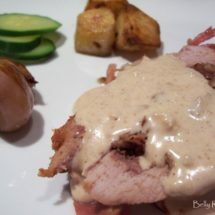 Slice up the cooked rolled pork fillet and serve with the sauce. Gag. Gag. Moth bits. Egh. Evil. Can eat offal. Can't stand moths. Gross moths aside, your walnut butter looks delicious. Still thinking about moth bits. Unfortunate about the jar of pickled walnuts, never actually thought nuts could be pickled. Sounds like a very lovely sauce. I am definitely going to try the walnut sauce very very soon. It looks like it could be perfect with chicken as well. Hi MD, I would probably add a little something to the sauce if I was going to use it with pasta, it went well with the pork, but with a pasta I think it may have been a little bland. Yep ewwwww, the walnuts seem to be young and still in their shell. They were in a pickling solution, of vinegar and spices, they did smell lovely beside the face they had a little friend. They say to use them in stuffings or on a cheese board as well as other suggestions. Perhaps the walnut cream sauce could be used to dress pasta as well? And ewww to the unpleasant surprise when you opened your pickled walnuts! Just out of interest though, what were they pickled in? Not familiar with pickled nuts, I must admit.